As part of a proposed lease extension for city-owned land on Watson Island, Jungle Island has committed to fund purchase of a City of Miami trolley – which could become the first piece of a long-awaited public transportation link between the city and Miami Beach. The trolley was one of many commitments made Friday at a special meeting of the Miami City Commission. After nearly four hours of debate and public comments, commissioners unanimously approved a referendum on a lease extension and hotel plan for Jungle Island. The proposal will be placed on the Aug. 28 primary election ballot. Commissioners needed to act by June 8 in order to file the proposal with county elections by close of business in order to meet the deadline for the August ballot. It involves Jungle Island’s plan to build a hotel as part of a multi-million-dollar redevelopment of the animal theme park on city-owned Watson Island. The city leases the land at 1111 Parrot Jungle Trail to ESJ JI Leasehold LLC. 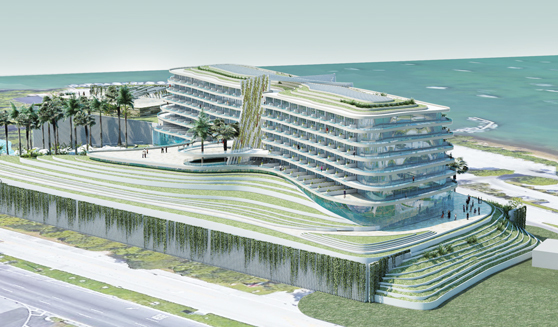 The hotel and lease extension require the approval of voters. A lease extension (for an additional 39 years, plus 15-year option) would mean more revenue to the city, contributions from ESJ to an adjacent park for improvements and money for low-income housing, and the promise of hundreds of new jobs. The island is in Commissioner Ken Russell’s district and he brought up the addition of trolley service, suggesting two trolleys operating to and from Miami and Miami Beach, via Watson Island. Public transit linking the two cities has been planned and discussed for many years, but nothing has yet been established. It has used a working title of Baylink, a word Mr. Russell used. He said a few things needed to happen before ESJ earned his vote to call for the referendum. “I am looking out for the betterment of the city… and for the quality of life for my residents,” he said. “To earn my vote, two or three things need to be addressed… Any project on MacArthur Causeway should always anticipate adding to the Baylink. This should be the hub, where the spokes meet,” he said of Watson Island. Adding two trolleys operating via the causeway benefits many parties, including Jungle Island, he said. A representative of ESJ committed to providing one trolley by 2021. The rubber-tired trolleys are built to look like old-time street cars, and currently cost about $200,000 each. Miami’s trolley system has remained a free service since its launch in 2011. Mr. Russell also pushed to add the limit of 300 rooms as part of the ballot proposal language. Mr. Russell was also successful in getting ESJ to commit to limiting the height of planned zipline rides as part of new attractions planned for the park, which reopened at the end of May after cleaning up damage resulting from Hurricane Irma. ESJ representatives say the new Jungle Island park, hotel and amenities are expected to create nearly 500 new permanent jobs. A similar plan was discussed last year but deferred in July to afford ESJ’s team more time for community outreach. Some nearby residents, particularly those on the Venetian Islands, have been critical of plans for additional development of Watson Island, a barrier island connecting the City of Miami to Miami Beach. Added traffic and noise, and impacting view corridors are principal concerns raised. ESJ representatives said they have met multiple times with neighbors and kept them in the loop as the design of the hotel evolved. The placement of the hotel – on the footprint of the existing two-story parking garage – was determined to have the least impact on views from the neighboring islands, they said. Other neighbors call Star, Palm, and Hibiscus Islands home. The June 8 meeting brought out scores of people, speaking on both sides of the issue. Many Biscayne Island residents, who live on the Venetian Causeway and are closest to Jungle Island, asked for a deferral, saying there wasn’t enough detail in the proposal. Proponents of the plan spoke favorably about the unique venue provided by Jungle Island and about the benefit of added employment opportunities. Mr. Russell also pushed for a buffer between new improvements at Jungle Island and residences on Biscayne Island. He said Jungle Island will provide an average of a 50-foot buffer between the new lagoon and the water’s edge, and has agreed to lower the zipline tower to address the concerns of nearby residents. Commissioners also amended the ballot language and beefed up the amount ESJ would have to contribute for affordable housing, from $500,000 to $750,000, plus $35,000 a year beginning in 2021. Commission Chairman Keon Hardemon fought for the extra money going into the city’s affordable housing trust program. As part of the proposed new lease, ESJ would have four years to obtain the master building permit and start constructing the hotel, and have up to six years from that date to complete construction. If the company doesn’t meet deadlines for the hotel, or chooses not to build the hotel, the lease would revert to the current lease, which expires in 2060. Questioned by commissioners, city staff said the other planned additions like the zipline and trampolines are allowable under the existing lease but would need specific permit approvals. ■The ballot language will state explicitly that there will be a 300-room maximum limit on the hotel, which would be built on the site of the current parking garage and ballroom (meaning there will be no reduction of green space). ■The minimum base rent to the city would increase to $1,215,000 per year. ■Jungle Island will allocate $750,000 for low-income housing in the city. ■Jungle Island would contribute $700,000 to the capital and maintenance of the abutting Ichimura Japanese Gardens (the only freely accessible City of Miami park on the island). Mr. Russell also got Jungle Island representatives to commit to no longer have captive large mammals, such as tigers, lions, orangutans and others. Miami is preparing a plan to launch a new trolley route connecting downtown to South Beach in hopes of providing some relief to congestion on the MacArthur Causeway. Currently, there is more than 5 bus routes that run between Downtown Miami to South Beach, why would they waste Tax Dollars on creating another new, unnecessary bus route from Downtown to the Beach? Also, how is riding a trolley on our congested streets suppose to help anyone riding aboard these stupid trolleys, from avoiding traffic. Once again, our elected officials demonstrating how incompetent they are when addressing our Nightmare Traffic concerns! They keep cutting routes from the local residents that need them to get to work, but keep creating routes that cater to tourist. Surely on-street trolleys are not being proposed as the final word on Baylink? There are already buses on the causeway and adding an additional route will do nothing to solve the congestion problem between Miami and Miami Beach. Do any of you use mass transit? I do and the more options the better. Not everyone uses buses and buses don’t go everywhere. Trolleys, buses, trams, Uber, taxis, heavy and light rail as well as bikes and sidewalks all have a place to move people.